I’m in mourning for my current favourite TV programme Twenty12 (BBC 2 Fridays), which finished last week. It’s a wonderfully clever, brilliantly written and superbly acted ‘mockumentary’ spoofing the Olympic Deliverance Commission, the body tasked with delivering the London 2012 Olympics. 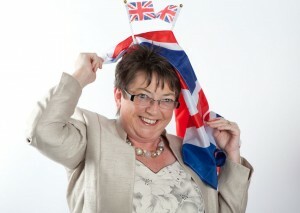 Jools flies the flag for London 2012 and offering free advice . One of the leading characters is PR Consultant, Siobhan Sharpe, who is Head of Brand and probably the biggest air head on TV after Bubbles in Absolutely Fabulous. As if PR Consultants don’t have a bad enough name as it is, actress Jessica Hynes’ character offers a catastrophic character assassination on PRs. The problem is…and don’t tell anyone I told you…I have actually worked with people just like Siobhan Sharpe. It was many years ago in a central London agency populated by gorgeous skinny young things, largely bankrolled by Daddy’s trust fund, who looked lovely, spoke beautifully but were clueless. It is a hilarious, if not slightly discomfiting watch. For any new business start-up, setting up an operation is stressful enough without having incompetent providers and suppliers around you. You want to be sure of your suppliers’ expertise and most importantly you want to be getting the best possible value for money. It is a misconception, often promulgated by organisations like the now defunct Business Link and arrogant business advisers like Robert Craven, that PR is expensive. It’s not. And certainly not in my house. Investment in quality advice can help kick start your start-up – whether that advice covers legal, financial or marketing issues. You don’t buy a dog and bark yourself. But you do need to ensure that those who will help nurture your new business baby know their stuff and are worth their fee. Any decent PR business worth its salt will offer you a free one hour consultation to evidence their credentials and expertise, talk through your business needs and offer advice. The same is true for all the good legal and accountancy firms I know. That should be plenty of time to determine whether you have a Siobhan Sharpe or a Jools Payne at the table. Yeah, totally, I mean duh! (I accept that last sentence will be totally lost on those who have never seen Twenty12). You know that phrase ‘don’t ask, don’t get’? If you want to talk through your business issues I heartily recommend you pick up the phone and ask for an hour’s conversation. If you’re not prepared to do that you probably shouldn’t be going into business.